I love taking bride and groom portraits after the chaos of the wedding ceremony has ended. It is the first time they will actually spend time together as husband and wife. For this portrait I simply had the couple sit on a flat rock beside a pond, and just be together. I don't like to stage moments, but rather just let them naturally and organically unfold. 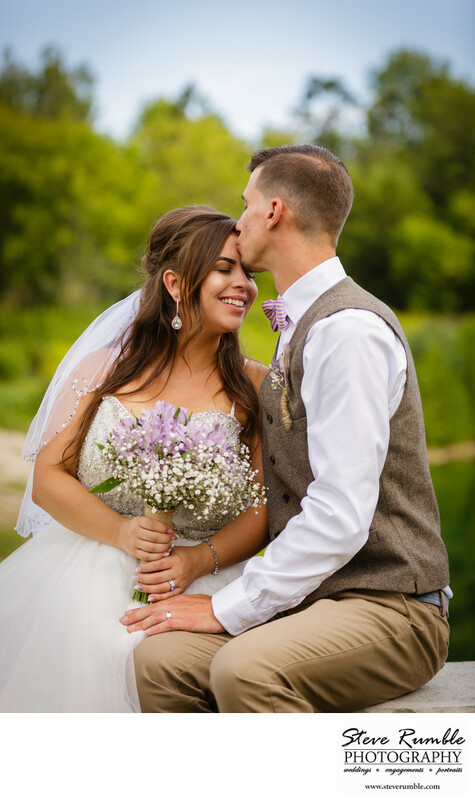 My 70-200mm f2.8 lens was the right tool for the job, because it allowed my to be far enough away from the newlyweds so as not to interfere with their moment, and it also allowed me to create beautiful bokeh in the background and blur out the trees and sky. I love this look so much - it really isolates and emphasizes the subject. My second shooter used a 50mm 1.4 lens during this stage of the wedding photography. When I work with a second shooter, I like us to use different lenses and focal lengths in order to give the bride and groom as much variety as possible in their photos. The Rolling Acres in Bowmanville is a gorgeous venue for an outdoor wedding ceremony. They have done a great job of creating an intimate outdoor space, and it is so convenient to have the indoor reception area at the same location. The property is not big enough that you would get lost, but big enough to provide a variety of settings for stunning wedding photography! Location: The Rolling Acres, 2941 Taunton Road, Bowmanville, Ontario.